⚜ We who manage the Théâtre de la Cathédrale understand that difficult and uncertain times lie ahead for many who live here. Know that we aim to provide shelter and sustenance for as many as we can. The infirm, the lame, the elderly, and children will be given priority, yet we will strive to keep as many people as we can safe from possible bombardment by the Covenant's forces by land, or by sea. Should you be incapable of getting to the Théâtre de la Cathédrale or learn that it is overfull, do not despair -- other shelters will be opened and available for the public to make use of. They will be listed here on posters like these as they become known to us. See to stockpiling food, now, and that you have provisions -- see to it that you possess what is necessary to survive for at least a few days, and that you have it on your person when you arrive at the shelter of your choosing. We will have provisions, but it is hard for us to estimate or quantify whether what we have will be enough. Come prepared for the worst, and hope for the best. Know that we who are a part of the Théâtre de la Cathédrale's troupe, and we who are dedicated to seeing as many people here given shelter, safety, and security in these troubled times, have come up with an arrangement aimed at providing as many as we can all three of these things. SOPHIE DE LA CROIX-JALABERT has graciously offered to open the doors leading down to the Jalabert Estate's cellars, which are deep, away from the city walls, and can comfortably be occupied by hundreds of people. Those who visit the Théâtre de la Cathédrale need not fret -- for people will be present to see you guided from the Théâtre to where we have chosen to relocate. Furthermore, any and all donations of food, potables, medical supplies, or other provisions related to survival should still see it left either inside the Théâtre de la Cathédrale or with someone affiliated to the troupe. ⚜ On behalf of both House Jalabert and the Théâtre de la Cathédrale, we wish to commend both the Council of Brilliance and its former member, Ricardo Diosa, for taking steps to provide those in need of shelter and protection another place they can go to. 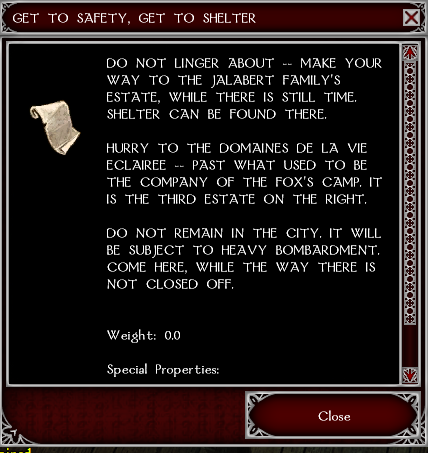 We will continue to offer shelter to as many as we can at the Jalabert Estate; however, those who wish to remain behind the walls and believe the Grand Opera National can provide them with adequate protection in spite of the so-called "Blood Opera" that occurred there months prior, are urged to accept his magnanimous offer of safety and security. It is far wiser to do this than to hope whatever building you reside in is capable of withstanding bombardment from the Covenant's forces.